A conclusion has been reached. The thread has turned too long and veered off-topic. I will create a new thread to hammer out the details in the upgrades. He gains the ability to cross dimensions open portals to large distances and he should have the same range as momoshiki via perfoming the exact same feat. Furthermore he says with his tomoe rinnegan hes able to transport people so since the juubi in its incomple form has the exact same tomoe rinnegan and madara has a complete one they should likely have it also. 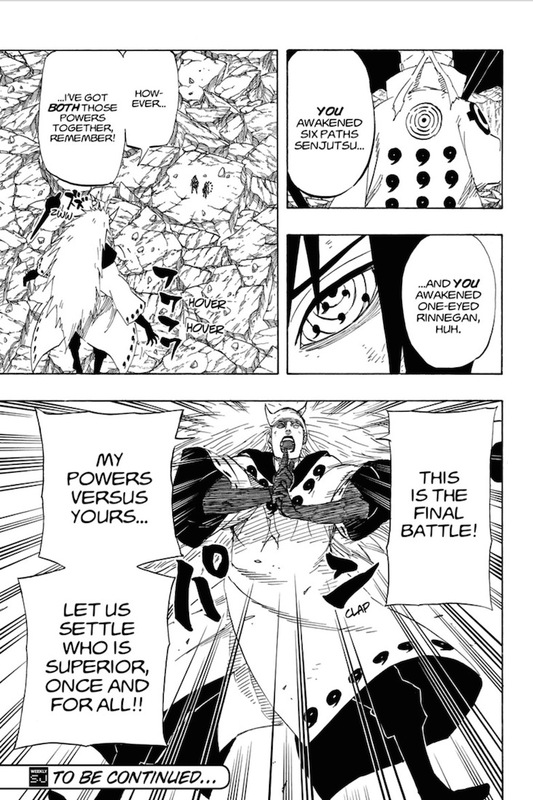 Momoshiki is defeated by naruto and boruto rasengan.Boruto uses rasengan a small regular one and naruto adds his chakra to it and makes it huge while hes being stabbed by black rodds which i believe were sucking his chakra away from him.Anyways thats a 5C feat for him .Lets not forget that minato and naruto already did a father son rasengan and it didnt do much at all this one is exceptional because of narutos six paths chakra as well as his kyuubi which he has both halves off now.Borutos chakra has nothing exceptional that would do anything out of the ordinary or trigger something naruto used his chakra to amplify that regular rasengan and make it moon+. Previous threads have been made regarding her but they were pretty pointless since the novels arent even written by kishimoto therefore not canon or at least cant be proven unless he suddenly states he approves them. Anyways we see in the beginning of the movie itself within her snow dimension that there was a moon which means her other dimension also contained a star (sun) which should be enough evidence to bump her to tier 4C or low 4B as she said create a new dimension this means Expansive TSB was previously used for the latter.Oh and btw its 100% confirmed that its her snow dimension because we see the exact same castle .And its where sasuke and kinshiki fight. This has been brought up alot but ill just provide my points as to why the arguments established for his tier were not valid whatsoever. Secondly madara never used six paths chibaku tensei so i dont even see how in the world you can base his power off chibaku tensei and claim hes not more powerful or at least equal to hagoromo who himself is only moon level via that single technique which is used for sealing btw so theres no reason for him to use it in the first place. 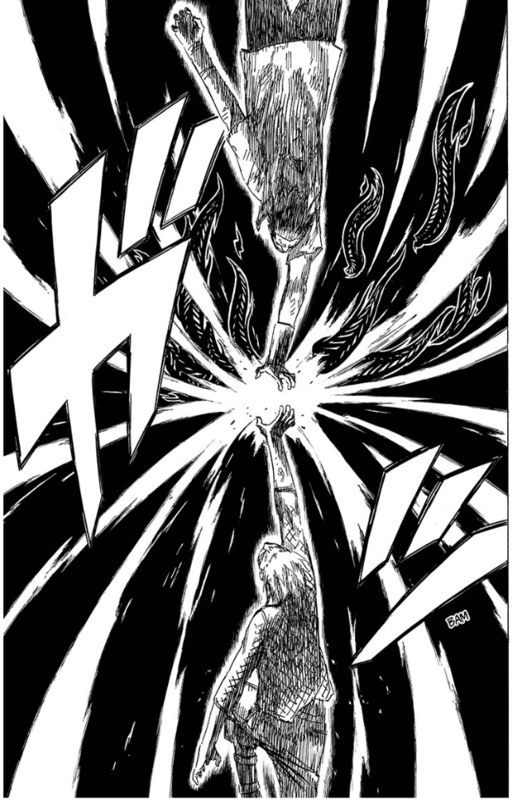 Thirdly Madaras power was at least equal to hagoromos before the zetsu thing. Why you may ask let me explain things established whitin the series and prove it so. Sasuke upon acquiring half of Hagoromos chakra gained an incomplete Sha rinnegan . If Sasuke had also been given the other half naruto was given hed get this . Hagoromo mentions madara being near him. And this was before madara had gained his second eye and absorbed the shinju three. 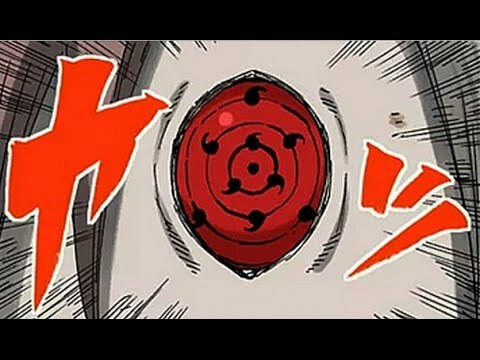 When you gain power in naruto your eyes change depending on the amount but this is exclusive to those who had eye power prior unless you're skipping two stages.Like Naruto for example if he gained both Ying and yang halves instead of just yang he'd get rinnegan. Momoshiki had a premature rinnegan and upon gaining power it turns purple and into a regular rinnegan he also awakens a third rinnegan on his forehead. Theres also sasuke who awakens incomplete rinne sharigan as ive previously mentioned. In Madaras case he absorbs the shinju three and gets his second rinnegan . He awakens a complete sha rinnegan is what happened . Which further proves that he reached the same power hagoromo has now at the very least. Also Otsutsukis regularly have byakugan this means that when kaguya ate the fruit she gained her complete sha rinnegan to show it. Once madara got juubi extracted he no longer had his third eye which should explain why hagoromo no longer has it despite that he still has its chakra to some extent which is why he can use ying yang release. So how is he not 5C exactly give me valid reasons why. Half of these things not only don't have to do with Boruto, but covers something that goes against the rules (Upgrading Kaguya to stellar/universal) and has been discussed before (Madara's tier). Nope the whole kaguya thing was discussed because the novel stated it was a parallel world which is non canon i didnt mention any of it.As for madara well i used evidence from the movie what else. Upgrading Kaguya that high is still against the rules, and Madara's power in relation to Hagoromo's has already been discussed. So if Kaguya is 4-c how can Naruto and Sasuke still hurt her, if she's tier 4 then everyone should be tier 4 too, hmm, hard to believe and to think she was using all her chakra to blow the earth up, anyways that's just my thoughts and maybe someone may have a better idea on this. How is it against the rules i gave an actual argument as to why and used canon material just like how link was upgraded. And as for madara well i presented evidence from the movie so its not rehash. The only time she hurt was her was from moves that ignore conventional durability. What about when Naruto obliterated her hand? This would contradict Naruto: The Last with Toneri using the moon to try to destroy the Earth, if Kaguya was actually that powerful then Naruto would recieve and upgrade along with Toneri which will surely contradict the plot for the Naruto: The Last. If by what your going is correct then Toneri would had not needed the Moon to destroy the Earth in the first place. This would contradict Naruto: The Last with Toneri using the moon to try to destroy the Earth, if Kaguya was actually that powerful then Naruto would recieve and upgrade along with Toneri which will surely contradict the plot for the Naruto: The Last. I already adressed that previously the only times kaguya was harmed was from moves that ignore conventional durability.Naruto is nowhere near kaguya hes even bellow madara same goes for toneri. There's also the fact that if Kaguya was 4-C she would have beaten Naruto and Sasuke without any effort whatsoever. I'm sorry but I agree with The Everlasting. Upgrading Kaguya that high would be absurd due to the contradictions. Nope she wanted to absorb theyre chakra to begin with have you read the final arc? If Madara did reach the same power as Hagoromo then I see no reason why he shouldn't be 5C. Its fine but what about the madara thing? Well the madara upgrade doesn't seem problematic... Let's see what the others think first, though. ^ I agree with that. I think Naruto (and by extension Kaguya) aren't given enough credit for their feats honestly. Naruto's attacks hurting Kaguya is understandable because he uses Senjutsu attacks, which is a weakness for her. The only reason he was able to cut off her arm was because of the fact she was exhausted and he's literally wearing Senjutsu via RSM. 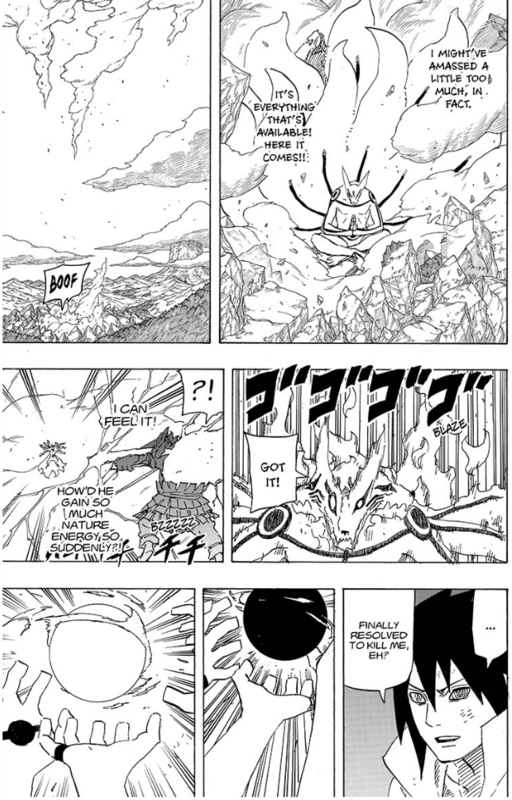 Naruto was also able to overpower and knock back Kaguya and was capable of flying through her attacks with no problem. Kaguya's normal attacks are Moon Level+ according to this wiki. 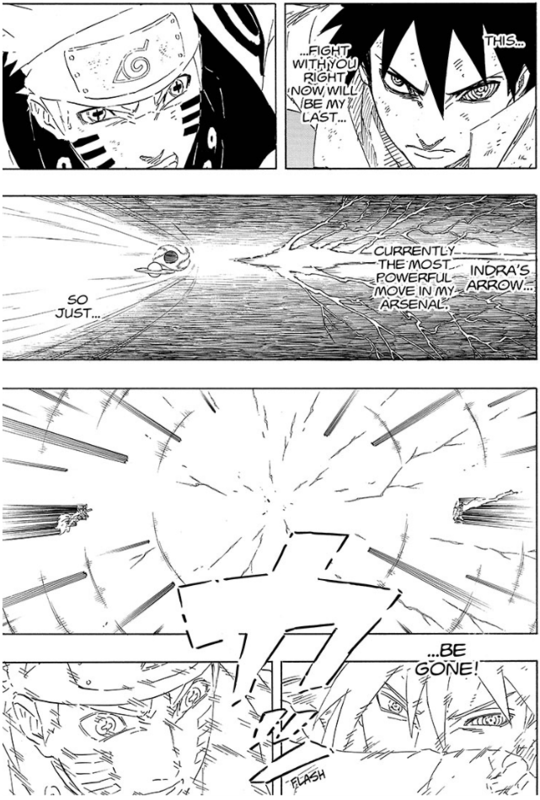 There's also the example of power seen by Naruto's attack and the power of his clash against Sasuke. Naruto's Bijuu Rasenshuriken attack shows that it would take a nice chunk out of the Moon she was sealed in and his clash with Sasuke showed an explosion that's bigger than the Moon she was sealed in. Not only was Naruto and Sasuke unaffected by this attack, they weren't using the strongest attacks they could yet. This happened soon after Kurama said Sasuke was on Hagoromo's level of power. Hagoromo is Moon Level according to this wiki. Statements and showing suggests that Moon Level Naruto and Sasuke aren't hyperbole, especially given the feats they were performing. This was all before they got stronger in The Last and Boruto movie. Base Momoshiki's normal attacks could destroy RSM Naruto's Chakra Avatar whereas the clash between him and Sasuke didn't bother them. This was before Momoshiki got more power and Naruto and Sasuke could still match him in power. This is yet another reason why they were fine at Moon Level (could go higher), and the downgrade wasn't necessary if you ask me. We've already had detailed threads on moon level sausage and narudo, and they weren't accepted. Pietro Maximoff wrote: We've already had detailed threads on moon level sausage and narudo, and they weren't accepted. I'm just going to comment on the Madara thing. Hagoromo himself said that Madara was nearly his equal with just one Rinnegan. How is it possible that Madara is weaker than him with the Juubi, both Rinnegan, the Shinju absorbed and the Rinne-Sharingan? That makes literally no sense. He has everything Hagoromo had and more. And for people stating that we can't use character statements, well that's kind of hypocritical considering we just upgraded Cell to Solar System level based on a statement (something I completely agree with) and Hagoromo's statement is just as credible. Valar Melkor 2 wrote: I'm just going to comment on the Madara thing. Hagoromo himself said that Madara was nearly his equal with just one Rinnegan. How is it possible that Madara is weaker than him with the Juubi, both Rinnegan, the Shinju absorbed and the Rinne-Sharingan? That makes literally no sense. He has everything Hagoromo had and more. And for people stating that we can't use character statements, well that's kind of hypocritical considering we just upgraded Cell to Solar System level based on a statement (something I completely agree with) and Hagoromo's statement is just as credible. None of those guidebooks were written by Toriyama and aren't considered canon. Also what reason would Hagoromo have to lie, and how could Madara possibly be weaker than him when he had every power/power-up Hagoromo had and more? Lol, I was steadily showing the power that everyone was showing and talking about the power they showed in the movies too. If Naruto and Sasuke's clash was dubbed Multi Continent Level and someone comes along and easily replicated the feat with his weaker attacks that Naruto and Sasuke was tanking and overpowering, wouldn't they logically be above Multi Continent Level? Unless you're saying that Naruto and Sasuke aren't stronger as adults compared to their teen counterparts? I've seen the discussions and nobody has explained how Madara could possibly be weaker than Hagoromo or why statements from one series can be accepted but not from another. (And no, non-canon guidebooks don't make a difference). Hmm, from the link looks like Naruto Databook does support even Obito being close to Hagoromo. ^And it's canon since its authored by Masashi kishimoto. You didn't answer the question. What's even funnier is the databook info CHILLVIBEZZ just provided that says that having the power of the Juubi means having Hagoromo's power. So you have a databook statement and a manga statement that proves what you said wrong lol. The bottom left caption says, "To acquire the power of the ten tailed beasts is the same as possessing the power of the Sage of Six Paths, so it is accompanied by the same Truthseeker Orbs. Maybe not, so can anyone here explain how it could be possible that Madara is weaker than Hagoromo? It would make no sense. 1.I have provided arguments a above even without the statement.And proved why . 2.The statement cannot be considered not credible because Hagoromo himself says so which is backed up by showings to prove it. 3.Id like to see arguments from your end saying he's not this and that because you believe so is not an valid argument. Could you link me those statements? Though it's not like I should care since I have showings. I don't see why obvious hyperboles in the databook mean we have to ignore the rest of it? The difference is the Obito/Madara being nearly equal to Hagoromo thing is not contradicted in the manga and is even supported. Plus it would make no sense for Madara to be weaker when he had everything Hagoromo did and more. Also since we accept the statements for other series there is no reason at all that we should ignore Hagoromo's statement. I mean, use some common sense, why would Hagoromo who was trying to help Naruto defeat Madara say it if it wasn't true? What would be the point of Kishimoto even adding it? His complete sha rinnegan is proof enough tbh... But let's wait for more input. Manga statement supported by the databook means that it's not all hype like others have been saying. Pretty much everyone who was downgraded (Naruto, Madara, Sasuke) should be upgraded again via powerscaling from Hagoromo. People have been upgraded with less after all. Madara isn't superior to Hagoromo. Not even close. Wbaez93 wrote: Madara isn't superior to Hagoromo. Not even close. Madara is superior to Hagoromo otherwise he wouldn't have rinne sharingan or even be the host of Kaguya in the first place ..
'Rinne Sharingan' means nothing. Provide actual feats and not weak statements. Wbaez93 wrote: 'Rinne Sharingan' means nothing. Provide actual feats and not weak statements. I'd like to see your arguments towards everything I stated above also awakening rinne sharingan is an actual feat. Are you going to continue saying that Madara > Hagoromo due the Rinne Sharingan? If so, then there's nothing more to say. Madara and Hagoromo both have the Rinnegan and Juubi but Madara has the Shinju absorbed and the Rinne-Sharingan. How is he inferior to Hagoromo? He has all of his abilities and more. The Databook states Madara and Obito were both near Hagoromo's level with just the Juubi and one Rinnegan, and Hagoromo states it himself in the manga. How can it be argued Madara is weaker after gaining the second Rinnegan Rinne-Sharingan and Shinju? Also Cell was recently upgraded based on a statement, so I don't see a reason to ignore Hagoromo's statement. 1.I said Madara >>>Hagoromo without Juubi and third eye. ^Want no but it's bound to be brought up eventually anyways and it's a feat so why not? I find it hard to believe that Madara is weaker than a hagoromo on deathbed even with rinne sharingan. That goes against basic powerscale rule of Narutoverse. 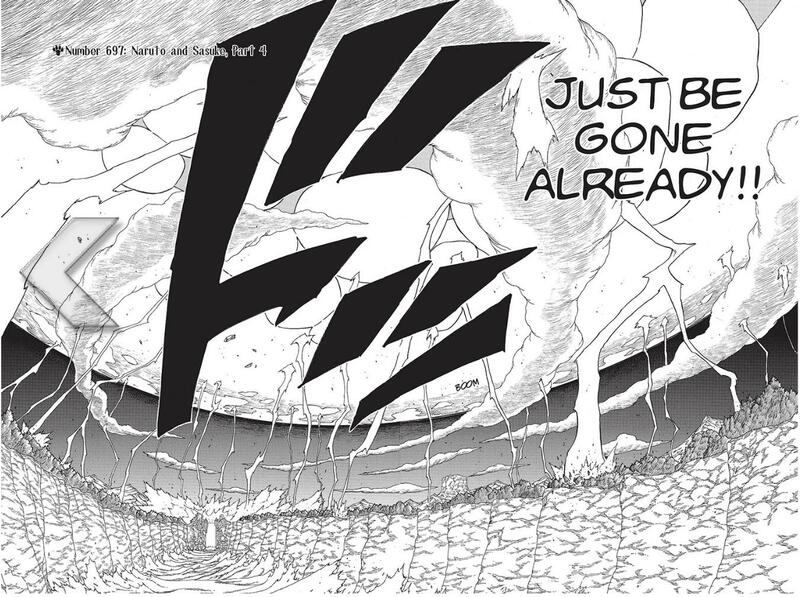 Madara was used as Kaguya's vessel after absorbing god tree. I guess we should put sakura to stellar level, She injured Kaguya. I agree with Sheoth that it might be reasonable to upgrade Madara to Hagoromo's level, or just below it (given the explicit statement that Madara was getting close to him in power), possibly along with Naruto and Sasuke. However, I also think that Kaguya at star level seems too contradictory. At best she would be a glass cannon with only one specific non-combat-oriented technique at that level, but I am still hesitant to introduce such a massive upgrade without very explicit proof. I agree with Sheoth that it might be reasonable to upgrade Madara to Hagoromo's level, or just below it, possibly along with Naruto and Sasuke. As for Kaguya well even without assumption based arguments isn't the fact that the moon is in orbit proof enough for her dimension to place her at 5A at least ? LordAizenSama wrote: I guess we should put sakura to stellar level, She injured Kaguya. 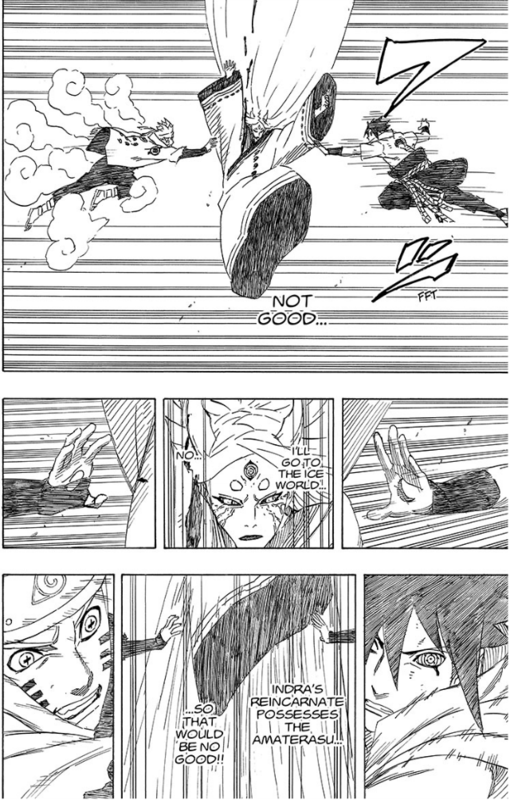 She brushed off their most powerful attacks the only time she was injured was by moves that ignore conventional durability or senjutsu which is her sole weakness we've been through this. I also think that it seems safest to keep Kaguya where she is. And I see no calculation that puts Madara's feat at High 6-A. However, Hagoromo explicitly stating that Madara was almost equal to himself seems more legitimate. That said, I would like to see more input from the rest of the staff before we change anything. Anyway, please keep this discussion clean and civil according to the rules of this wiki. The argument used was it could be artificial sunlight that was hitting Sasuke and the same goes for the supposed moon in her snow dimension well we got confirmation her dimensions got space and that there's a moon in one of them. 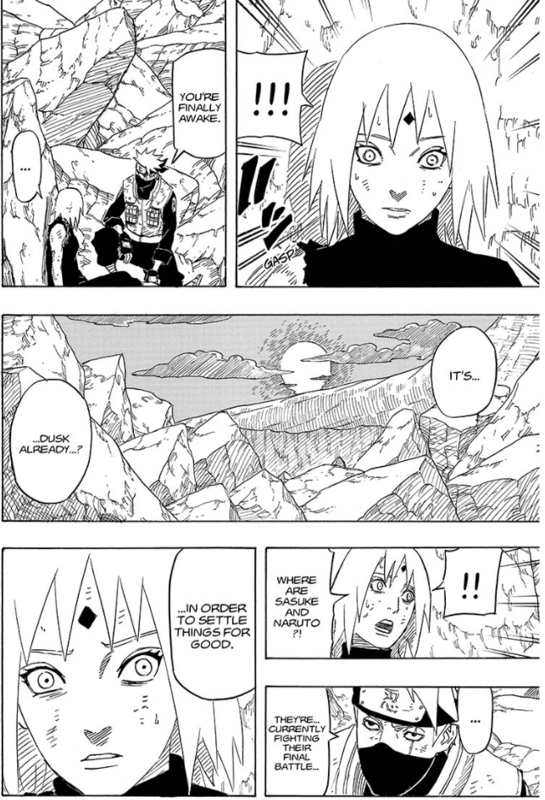 Kakashi used a technique that bypassed conventional durability it even says so on his page kamui raikirii.As for the rest she only has 5A for one move she can't one shot anything she wanted to absorb their chakra at first but then decided it was too risky I believe so she decided to get rid of them. Also i don't mind Madara being upgraded to Hagoromo's level, but Kaguya stellar level is way too absurd and should not be taken seriously. Well the thing is that Hagoromo said Madara was near him before 2 power ups he absorbed the shinju three the Juubis true form as opposed to Hagoromo who absorbed prime Juubi.And he gains a second rinnegan he had 1 when Hagoromo stated what he did. Upon gaining all those he awakens the same eye Kaguya did. A complete rinne sharingan.Remember Momoshiki awakens rinnegans when powering up so did Sasuke he awakened a incomplete rinne sharingan. This should mean that Madara is at least Hagoromos level without Juubi.Who is still 5C via still having Juubi chakra despite losing the rinne sharingan Madara gained.Just as Madara lost it when Juubi was extracted from him. Oh and shin jokai koutan ensnared the entire planet it's high 6A from what I can recall. Madara being hagoromo level or stronger is fine. kaguya being 5A is not, that would make naruto and sasuke 5B, which would then make prime hagoromo 5B, and upgrade for all sage characters. utter chaos eventually. no need for that. The Hagoromo thing seems rather reasonable, though I am not the most qualified to say. The Kaguya thing on the other hand, is not. Seemingly creating a pocket realm which contained a star isn't enough to counteract being beaten up on by some multi-continent level characters that she could have flicked to death had she been tier 4. But she should only be stellar via one move explicitly she was caought off guard and sealed because of it .She also wanted to absorb their chakra not kill them first thats why she separated them. Well, we are probably not going to upgrade Kaguya, unless it is in a non-combat-oriented glass cannon sense. But even so, it seems far too contradictory. However, I suppose that placing Madara, Naruto, and Sasuke at "At least Moon level. Possibly Moon level+" seems reasonable, given that Hagoromo was calculated at a little over 1 Zettatons even on his death bed. Moon level currently goes up to 4 Zettatons, and Moon level+ up to 80 Zettatons. Yeah ok that seems fair to me. Well, let's wait to see what other staff members think first. I agree with not upgrading Kaguya and leaving her as is. Simply put, if she was any higher than 5-C, she would have literally won against Naruto and Sasuke. For her, she's fine the way she is. For the Madara upgrade, i agree with upgrading him back to at least 5-C. It just doesn't make sense that Madara would be weaker than Hagaromo even after all the power ups he got before Kaguya showed up(like the meteortie feat he did that he described as "raindrops", for example). And i guess Naruto and Sasuke could also get re-upgraded back to Moon level too considering both are supposed to be around Madara's level or something by EoS. Okay. Thank you for the input. I told it earlier - I'm against using movies for powerscaling for characters which originally from manga. But if we use it, I'm agree with CrossverseCrisis. Do I get a piece of this Watermelone. So, given the rather confusing mess of statistics for Naruto, Sasuke, and Madara at different forms, or states of their development: Which ones should be adjusted, and by how much? Depends, does Sasuke's Libido Eye blink on and then turn off when he's not in the "heat" of battle? That could be a giant factor in his power level. Anyway, Naruto and Sasuke got weaker or something, I don't know. Should be as strong if not stronger than Madara but who knows. Madara is Moon Level I'm guessing. Madara: Moon Level+ (gained more power than Hagoromo by gaining Kaguya's power). This would be his form with the Shar Rinnegan. Naruto and Sasuke: Moon Level as teens EOS and At least Moon Level as adults. 1. Using tomoe to equalize powers and abilities is both irrational and inane. Not to mention the fact that people with same eyes do not necessarily have the same abilities, even in series (such as Madara having very different abilities from Nagato). 2. Regarding Kaguya: Not only is the size of Kaguya's dimensions indeterminate, it is also impossible to know if Kaguya was the one who created them in the first place. For all we know, it could very well be that similar to Sasuke, Kaguya could simply have access to other dimensions (instead of creating them). Additionally, if Kaguya was Tier 4, it would be impossible for Sasuke and Naruto to put up a fight against her attacks. Ditto for Hagoromo and Hamura (against the Juubi). 3. Speaking about Sasuke, yes, I agree his range (only) should be upgraded to cross-dimensional. Please also add that this is likely a non-combat ability, otherwise Sasuke would have used it in battle in the Boruto movie. Also mention that the ability hinders his other Doujutsu abilities. 4. Regarding Madara: I agree with upgrading him to 5-C. He was almost equivalent to Hagoromo (with both eyes), both in abilities and power. 5. 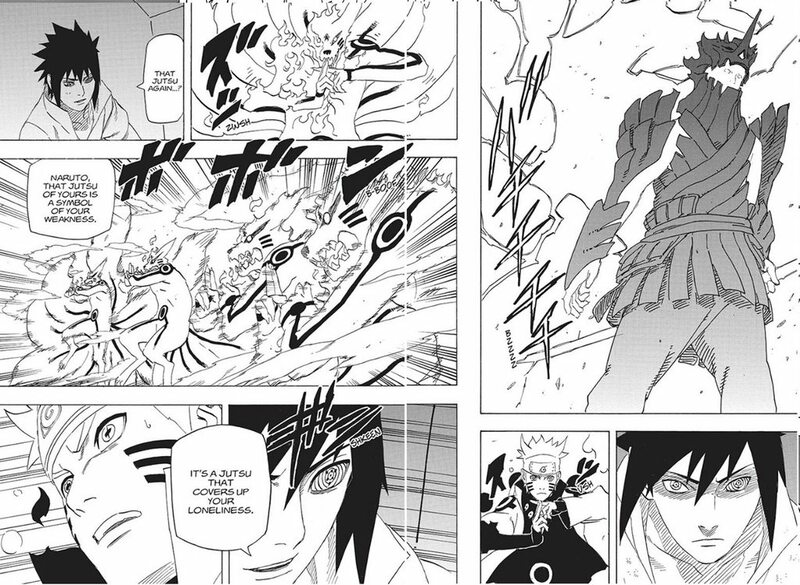 Lastly, regarding Naruto and Sasuke: They were both capable of matching Madara, but could beat him together only. I think the appropriate tier for them would be "At least High 6-A". This tiering also holds true for base Naruto overpowering Toneri's attack in The Last. I want feedback from other members on point 5, though. I agree with Kav in upgrading Madara to 5C. Naruto and Sasuke being at least High 6A I can also agree with as I doubt they were as powerful as Madara was at full power. Having the power of the Juubi is like having Hagoromo's power. Hagoromo gave Naruto and Sasuke half that power, but Naruto also received all the powers of the Bijuu which is like having a Juubi Jinchuriki's power as stated by Madara. This means that Naruto was near Hagoromo's level of power too. During their final fight, Sasuke used his Susanoo as a container for the Bijuu's power like a Gedo Mazo which put him on Hagoromo's level of power according to Kurama. Despite that, Naruto was capable of matching Sasuke by absorbing all the energy on Earth and managed to stalemate him in power. I don't see how all that can be considered Multi Continent Level because of the above honestly. Using all the energy on Earth to power up your attacks seems like it should be Moon Level at the very least. They were an unknown distance in the air and the explosion scattered. That doesn't make it any less more powerful. This would be Attack Potency rather than Destructive Capacity. Logically, there is no way Naruto would be as strong as Prime Madara. Prime Madara had everything, even more than Hagoromo. I don't see how Naruto is 5C honestly. To keep it short: I believe Lord Kavpenys reasoning makes sense so, in my opinion, we should go with it. Neither was the Spirit Bomb Goku used on Frieza in the Namek Saga. That didn't make it any less powerful though. If having all the power of the Bijuu automatically puts you near Hagoromo's level of power, why wouldn't a planet's worth of energy give as substantial boost in power? Non-Bias wrote: Neither was the Spirit Bomb Goku used on Frieza in the Namek Saga. That didn't make it any less powerful though. I agree with Lord Kavpeny with the exception of point 5. Given that the Moon level and Moon level+ categories are quite wide, even if Naruto and Sasuke were individually only half as strong as Madara, they would likely still fulfill the requirements for the same level. Hagoromo was near the upper limit of Moon level even at his death bed, so I find it reasonable to place all of them at "At least Moon level", or possibly "Moon level+", but I suppose that is more iffy. 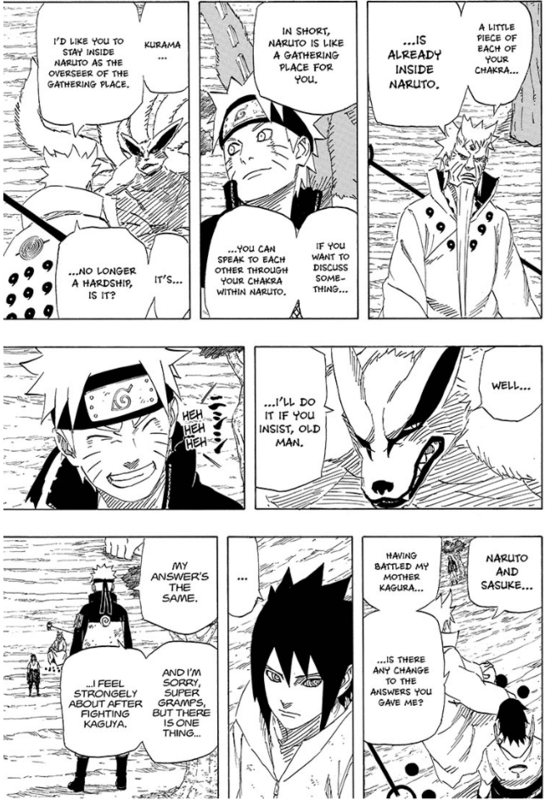 Well the thing about it is Naruto got a final power up at the end of the manga.He gains the second half of kyuubi which should amplify his power by a lot.Naruto at the end of the movie takes a regular rasengan and makes it moon level in a weakened state while his chakra was likely being absorbed there's that for evidence. @Antvasima: Perhaps they might qualify as Moon level, perhaps they might not. Isn't that the point of using "At least" in conjunction with High 6-A. @ChillVibezz: Incorrect. Naruto's Rasengan overpowered a Continent level attack, not a Moon level one. Wait the attack is continental? Isn't Momoshiki moon+ and the rasengan didn't stop there it destroyed shinju three ,rose to the atmosphere and made a pretty big explosion in space. Well, as I mentioned, given the width of the category, and that Hagoromo was at least at the upper limits even at his death bed, even if they were only half as strong as Madara/Hagoromo that should rationally still automatically warrant an "At least Moon level" rating. Or so I think at least. I take it you didn't watch the last or the boruto movie? He overpowers a continent+ attack in KCM by borrowing some chakra from kyuubi.And there's turning a rasengan strong enough to beat a moon+ villain overpower his final attack destroy shinju three and make a pretty big explosion in space. I take it you didn't watch the last or the boruto movie? ^I edited the comment btw. I take it you didn't watch the last or the boruto movie? He overpowers a continent+ attack in KCM by borrowing some chakra from kyuubi.And there's turning a rasengan strong enough to beat a moon+ villain. how is Momo moon level again? Just took a quick look on the thread , Shar rinnegan doesn't give you all the abilities from the verse (unless you have evidence that it does). Madara may be stronger than hagoromo in terms of raw power but hagoromo is moon level via his special six paths chibaku tensei. Madara's stats need to be updated :Six paths madara should be continent level in both AP and Durability (he is stronger than obito (who himself is continent level) and he survived naruto's lava rasenshuriken). Six Paths Madara (with shinju absorbed and his 3 eyes) should be multi continent level for fighting naruto and sasuke at the same time ( naruto and sasuke should be multi continent level as well since Naruto from the last is multi continent level with a mode far inferior to six paths sage mode). I think kaguya is fine where she is. Ten tails and hamura should be downgraded to multi continent level because non of them has six paths chibaku tensei and hagoromo is probably only (multi) continent level with his regular attacks. Kkapoios wrote: Just took a quick look on the thread , Shar rinnegan doesn't give you all the abilities from the verse (unless you have evidence that it does). By combining Ying yang seals you can get six paths chibaku tensei Madara used mugen tsukuyomi from the tablet which he'd only had read once I believe.Obito knows about six paths chibaku tensei hence his explaining at the kage summit.So yeah he should be moon and upwards.Otherwise Kaguya wouldn't be moon+. I thought that the calculator stated that 1.083 Zettatons was the most reliable calculation? Half of that is still Moon level. I think he was calculated could be wrong. @CHILLVIBEZZ that's not enough proof to say that the know it ,also zetsu probably wrote instructions on the tablet since he wanted the IT to be used. Kkapoios wrote: @CHILLVIBEZZ that's not enough proof to say that the know it ,also zetsu probably wrote instructions on the tablet since he wanted the IT to be used. He performed moves that Kaguya herself utilized.And sheer power should be enough Going by your logic Kaguya isn't moon+ ??? Kaguya can easily overpower multi continent people plus she still has the expansive TSB which is planet level. 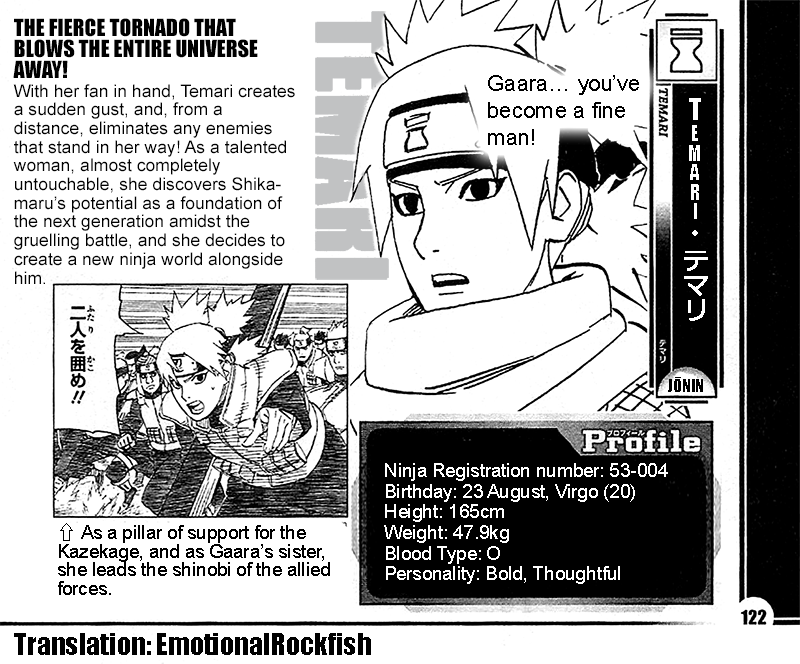 When did he performed jutsu that kaguya used?Also proof that kaguya knows six paths chibaku tensei? KK, what's 1.083 Zettatons/2 ? 500 exatons which is moon level. Kkapoios wrote: Kaguya can easily overpower multi continent people plus she still has the expansive TSB which is planet level. He easily kept both FP Naruto and Sasuke with one rinnegan and no rinne sharingan. He performed mugen tsukuyomi,Shin jokai koutan which ensnared the entire planet and should be high 6A. Also I'm referring to the fact that Kaguya without Expansive TSB is moon+ for sheer power. Kkapoios is the only one who's not ok with Madara being moon level, I get it? Since the page is locked it's likely been overlooked by an admin as such it's probably accurate though adding the link to the calc would simply things. Kaguya being moon+ level via sheer power is from the previous powerscaling that had everyone at moon level.Madara didn't use the space manipulation thing kaguya used.I agree with madara being high 6A not just with enviromental but with normal AP. I can ask the calculation group about it, but there is no guarantee that they have the time. Kkapoios wrote: Kaguya being moon+ level via sheer power is from the previous powerscaling that had everyone at moon level.Madara didn't use the space manipulation thing kaguya used.I agree with madara being high 6A not just with enviromental but with normal AP. 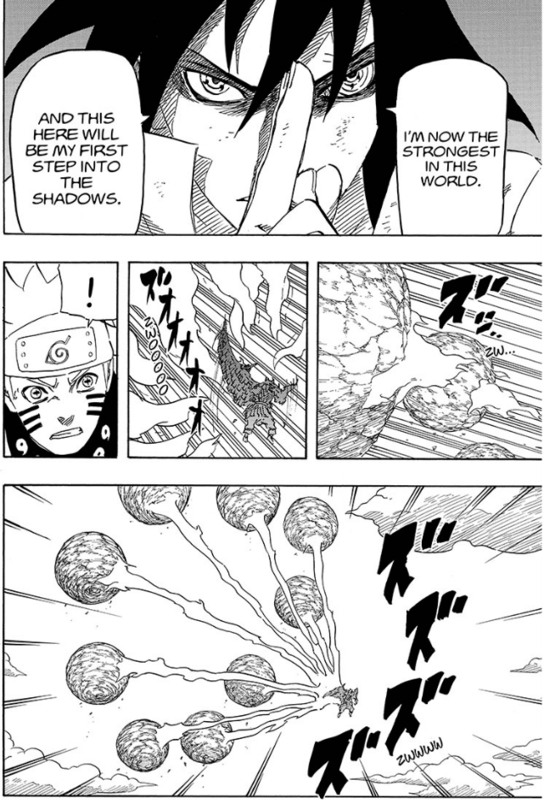 First half is true obviously but it's also from Hagoromo .And Madara had a limited amount of screen time he likely had space manipulation with his rinne sharingan dojutsu.Otherwise it wouldn't make sense.Madara is moon+ by sheer power and it's obvious he can use 6 paths chibaku tensei since he performs other moves with Ying yang release.And he did moves Kaguya herself had from the tablet. Six paths chibaku tensei is not simply yin yang release, otherwise multiple people could use it (even sakura), sha rinnegan doesn't give you SPCT . How is it obvious while there is no evidence??? Kkapoios wrote: Six paths chibaku tensei is not simply yin yang release, otherwise multiple people could use it (even sakura), sha rinnegan doesn't give you SPCT . How is it obvious while there is no evidence??? 1.Kaguya is noted moon+ without TSB for powerscaling from Hagoromo and hamura.But mainly Hagoromo. 2.In regards to the Ying yang release well as linked above he had both there powers.Which in combined in moon or more at least. But either way sheer power makes him 5C . That's not enough evidence to say that he posses the technique. Kkapoios wrote: That's not enough evidence to say that he posses the technique. Sheer power places him at multi continent level , Kaguya is vastly superior to madara and it was stated multiple times, he should be powerscaled from naruto and sasuke. Kkapoios wrote: Sheer power places him at multi continent level , Kaguya is vastly superior to madara and it was stated multiple times, he should be powerscaled from naruto and sasuke. Common knowledge??? Does he have anything that puts him at moon level because as fat as i remember kaguya and hagoromo are planet and moon level via special techniques that are unique to themselves and unusable by others. Since Hagoromo stated that Madara approached his own power, it seems safe to place Madara in the same tier. Is Kaguya moon level+ with her powers or with brute force? You should at least scale her with Naruto and Sasuke. Kaguya should be Continent level+ since this happen after they beat her-(Survived the clash from TBRS and Indra's arrow)/ then you can put Moon Level+ after that. Becuase looking at their profiles it seems that a continent level naruto and sasuke defeated Kaguya a moon level character. It doesn't seem right even do they where using the tsb to by pass durability but that would mean that Sasuke, Naruto and speacilly Sakura would never had deal any damage to her as a whole. Kkapoios wrote: Common knowledge??? Does he have anything that puts him at moon level because as fat as i remember kaguya and hagoromo are planet and moon level via special techniques that are unique to themselves and unusable by others. HokageMangaVox wrote: Is Kaguya moon level+ with her powers or with brute force? You should at least scale her with Naruto and Sasuke. Kaguya should be Continent level+ since this happen after they beat her-(Survived the clash from TBRS and Indra's arrow)/ then you can put Moon Level+ after that. Becuase looking at their profiles it seems that a continent level naruto and sasuke defeated Kaguya a moon level character. It doesn't seem right even do they where using the tsb to by pass durability but that would mean that Sasuke, Naruto and speacilly Sakura would never had deal any damage to her as a whole. What you can't be serious here the technique used to seal Kaguya is moon level in it of itself what is this downgrade you speak of? Well, Naruto and Sasuke beating, or at least sealing, Kaguya, seems to be a case of PIS or glass cannon nature on her part. I'm still baffled by all this. Having the power of the Juubi automatically puts you near Hagoromo's power, which means that Obito, Madara, and Naruto were near him in power according to the databook and Hagoromo. Madara gained more power than Hagoromo which should automatically put him at Moon Level. Naruto not only got power from Hagoromo, he gained all the power of the Bijuu and gained all the powers of a Juubi Jinchuriki as seen and stated by Madara. This was before he harnessed all the energy on the planet which greatly increased his power output. Naruto being Multi Continent Level for his EOS, The Last, and adult counterpart seems to suggest he's never gotten stronger, which is false. This attack itself was Small Country Level in potency while he was in BSM for managing to stalemate Toneri's attack and it's nowhere near his strongest attack or his strongest form. He should be Moon Level via powerscaling pretty easily in my opinion. Donwgrade? She could still be Moon Level+ with her powers. Unless Naruto is Moon Level+ before fighting Sasuke since both are but at Continent Level and Naruto manage to hit her a few times. That makes no sense, if she was truly moon level+ in base form she would have kill them completly. Also, she got seal in Ten Tails form, so her Ten Tails should be the one to have Moon Level+ and not her. She should be at least Continent Level+ to Multi-Continent Level+ in her base form and Moon Level+ in Ten Tails form. Last i check Kaguya was in Ten Tails form when she got seal. I think I addressed that many times over in this thread she brushed off their attacks.The only time she got hurt was by moves that bypass conventional durability.Naruto has senjutsu her sole weakness and kamui raikirii bypasses durability.Sakura only caught her off guard it's common. That does not explain why she was scale to Moon Level+ from her durability and later chance that she could terra form a planet. Since her durability with the Chibaku Tensei came from her been in Ten Tails form not in base form. Because both Hagoromo and hamuras powers are just scattered chakra of hers and both performed moon lvl feats.And I had no idea she was scaled off Juubi but that isn't relevant here.Youre free to make a thread about it tho. I have placed Kaguya's durability at "Unknown", given the highly inconsistent showings. Alright then.But did we get enough input to have a conclusion? Because both Hagoromo and hamuras powers are just scattered chakra of hers and both performed moon lvl feats.And I had no idea she was scaled off Juubi but that isn't relevant here.Youre free to make a thread about it. Is too much of a headche for me to do, right now. Maybe later. Before give my verdict i've a question: Why Momoshiki is Moon level+? Didn't someone post a thread saying that Momoshiki was weaker than Kaguya? Nevermind i founded. The Boruto Movie was written by both Kodachi & Kishimoto. Kodachi turned the Boruto Movie into a novel. Ergo, the novel is canon, because it was written by a primary source. In the Boruto Movie, it's clear that both Naruto and Sasuke did not use their full power against Momoshiki, as they did not use Chibaku Tensei, Three Headed Kurama, etc. Moon Level (Juubi)-Ten Tails, giving the calc, also someone should add the Juubi to Kaguya's page since she's the medium and she can transform into it. Now we can have a Planet Level (Hagoromo) -since he was said to be stronger than the juubi and he re-shaped the world with the sword of nunoboko after sealing the juubi. Well I need to go now.I'll be back later until then. Sasuke: Agreed about the portals via tomoe rinnegan. Naruto: This... i'm not sure. I agree with KamiYasha, to sum it up. All right, everybody who are not staff members and have already commented should probably stop posting now, as I think that they have all explained themselves by now. I am waiting for all the staff members to get the time to evaluate this without having an overly long cluttered discussion to sift through. In addition, I am waiting for the calculation group to get the time to decide whether or not Hagoromo's Moon-creating calculation is legitimate, and if so, which of the values that is most reliable? This is necessary to decide whether or not Naruto and Sasuke should be Moon level or Multi-Continent level. not one single feat that is actually calculateable or provable in any case, besides we have already discussed most of these stuff and reached a conclusion about the topics. kaguya, sigh..., why again? whether her dimensions have a sun or not isn't the point, the point is that even at star level (which is already a massive outlier compared to narutoverse), your trying to hide the much more obviuos outlier, if there's a star, theres a solar system, if there's a solar sytem, theres a galaxy, and if rheres a galaxy there's a widespread universe filled with stars, and a universe level kaguya is even more of an outlier, and even if its not what youre trying to say, that is what your evidence leads to, which means, you guessed it, no upgrade. about madara, we had this conversation already so many times, Feats take precedents before statements, especially vague ones, madara's feats put him at continent level, and that is a much clear precise indcator then some statements and circumstantial plot points. As for Madara well many characters make statements and are rated for them Yamamotos being one for example while he hasn't shown anything close previously.Hagoromo saying what he did about Madara would make complete sense as he was gaining the same power he did to begin with.Hagoromo himself is 5C for one move his Arsenal is not 5C same goes for Kaguya being planetary. Also by Hagoromos own words which can't get anymore credible stated he was near him that alone is 5C since being near is obviously being more than half as powerful let alone Madara after acquiring shinju three his second rinnegan and awakening his complete rinne sharingan. I just dropped Kaguya since none of the admins agree however Madara is perfectly justified as far as I know. Anyways it's if its you're opinion. While I do think Madara should get an upgrade. Kaguya, Naruto and Sasuke should stay where they are, Naruto and Sasuke having Moon Level potency at the war would make no sense at all, and Kaguya's reasoning makes even less sense. Also: Momoshiki is defeated by naruto and boruto rasengan.Boruto uses rasengan a small regular one and naruto adds his chakra to it and makes it huge while hes being stabbed by black rodds which i believe were sucking his chakra away from him.Anyways thats a 5C feat for him .Lets not forget that minato and naruto already did a father son rasengan and it didnt do much at all this one is exceptional because of narutos six paths chakra as well as his kyuubi which he has both halves off now.Borutos chakra has nothing exceptional that would do anything out of the ordinary or trigger something naruto used his chakra to amplify that regular rasengan and make it moon+. <--- just no if it was because of both them, only BOTH Naruto and Boruto together would have Moon Level+ not Naruto separately other wise Naruto would have beaten Momoshiki by himself. If feats take precedence over statement yusuke wouldn't be country level, raizen wouldn't be continent level. Yu yu hakusho is all about statement. The best feat was sensui busting a small hill. the difference is that yamamoto's statement goes along with the plot, actually limiting his actions considerably, is consistent with the nature of his bankai, and most importantly, has nothing that contredicts it, meanwhile all the statements that say Madara>=haguromo are actuallt contredicted by both feats and portrayel alike. when i bring up a suggestion and it gets denied, i drop it, most certainly i don't necromance topics every two months, we had this conversation, the upgrade got denied, let it be. statements when and where they contredict feats, become unusable, this is a prime case, madara at his best produced a continet level feat, what are going to believe, words or visuals? i believe visuals, as in scientific debate (or a semi-scientific one like this), words are less credible then meassurments and feats. Hagoromos statement is not contradicted nor invalid whatsoever. First of all Hagoromo himself is only moon level via single technique he doesn't have a 5C moves filled Arsenal and this goes for Kaguya as well. Madara performed chibaku tensei which was calculated at continent+ yes but it was just to distract them.He performed shin jokai koutan and mugen tsukuyomi as well two techniques directly from Kaguyas Arsenal one of which is high 6A via ensnaring the entire planet. Finally if Madara did surpass at least current Hagoromo then Kaguya would not be 5C moon+ without obtaining her full power and Madara wouldn't become her vessel. Madara was near Hagoromo and he easily kept up with Naruto and Sasuke both of which had half of Hagoromos power with a single rinnegan. He gained his second rinnegan and absorbs shinju three and what does he awaken the same rinne sharingan that Kaguya herself awakened ages ago and likely Juubi jinchuriki Hagoromo . I'm lost now, how is scientific debate usable in fiction? Please immediately stop derailing this thread by discussing Bleach, or blocks will start to be handed out. Please immediately stop derailing this theead by discussing Bleach, or blocks will start to be handed out. I was not the one to brought that subject up, but I agree we should stop. This is about Naruto not Bleach. Antvasima wrote: Please immediately stop derailing this theead by discussing Bleach, or blocks will start to be handed out. I only exemplified how statements were accepted but my bad tho. All of the admins agreed upon Madaras upgrade. Sasuke is just gaining new techniques. And Kaguyas was refused for numerous things.. Agreed with everything Lord Kavpeny said. Kaguya: There is no way that Kaguya is Star level or anything higher than that. Kaguya's ETSB was calculated at 87.855913 Zettatons. Planet level+ starts at 8 Yottatons. In order for Kaguya to advance from the Planet level to the Planet level+ category, she would have to get literally 91.0581852356369 times stronger than she is currently listed. Sasuke: I agree about the portals via Tomoe Rinnegan. Naruto: I don't know what to think about this. However,if Momoshiki really is Moon level / Moon level+, then I think Naruto and Sasuke should get upgraded as they were capable of keeping up with him / overpowering him, and Momoshiki even admitted that Naruto and Sasuke fighting together were stronger than him. So Momoshiki, Naruto, and Sasuke are all roughly equal in power, with Naruto and Sasuke having a slight advantage. Madara: Fully agree, he should be equal or at least as strong as Hagoromo who is Moon level+. Hagoromo himself stated that Madara was near him in power, and that was when Madara only had 1 Rinnegan. Hagoromo has no reason to lie, so I think we can trust his statement. No, we won't upgrade her to that high(unless your refering to her ETSB, that is). Even then, we have already decided on not upgrading Kaguya in anyway. ^I was just expressing how I feel on the topic. ^I know that, but you could have at least be specific as to what Kaguya would be upgraded to. If it was to her ETSB, that would make more sense. If was to her AP, then no cause she would have stomped Naruto and Sasuke in the manga and not lose. I agree with what Lord Kavpeny said. Thats my bad. I think her ETSB would be 5-B+. A stellar Kaguya would be too weird. But it wouldn't be the first stellar glass canon on this wiki. Lol, you do realize that the ETSB calc assumes that Kaguyas parallel dimension is only a planet, then calculates what it would take to blow up the planet. Kaguya's parallel dimension's were proven to be Stellar in size above, and in this thread. Hence, the ETSB calc is woefully wrong. 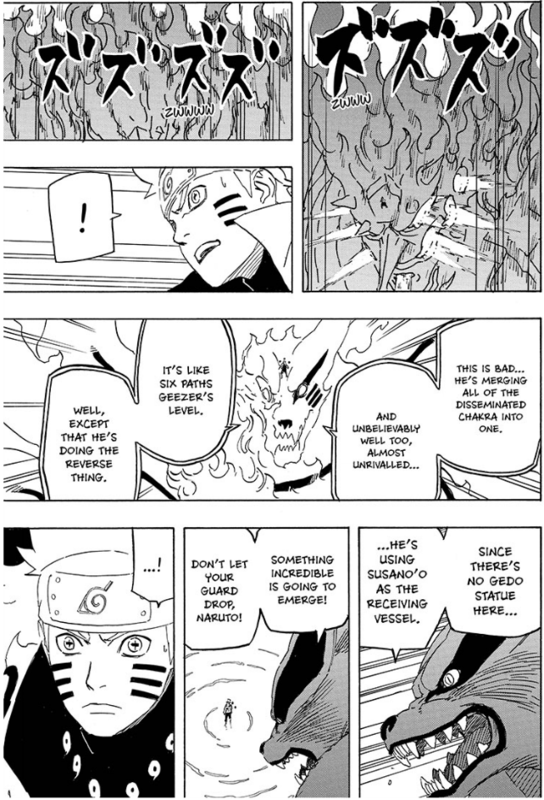 The central issues here are whether or not Madara should be upgraded to Moon level based on Hagoromo's statement and whether or not Kaguya should be upgraded, are they not? If we upgrade Madara, the main characters should logically follow, shouldn't they, since they fought and defeated him? That said, I agree with upgrading Madara. I presume Hagoromo is one of those characters who is supposed to be an extremely powerful and wise figure central to the lore of the verse, yes? If that's the case, especially in the absence of outright contradicting circumstances, there is no reason to disregard his words. Frankly, Illuminati's "feats > all" logic I find is completely ignorant of the extremely common use of characters like Hagoromo as exposition devices. Basically, Madara, by his words, was nearly as strong as he was, and from what I could gather, got more upgrades later on, which would seem to point to him at least being an equal to Hagoromo by the end of his run. There is a major issue here; the fact that her dimensions are taken as Planet-sized is all that's keeping her consistent with the rest of the verse. There are already issues with scaling the rest of the cast to her; if she turns out to be Star level, almost anything the main characters do to her will have to be taken as an outlier or PIS. She'd end up being a similar case to Magolor or Solaris; rated by her showings, but not scaled to the rest of the verse because the power she displayed was so far above what the rest of the cast should reasonably be capable of that defeating her can only be assumed to be major PIS. Wasn't Sasuke equal to the So6p? Wish I could help but I know nothing about Boruto. Any of these get calced? So has it been agreed that Naruto, Sasuke, and Madara should be put at moon level via power-scaling from Hagoromo? Hagoromo without the power of the Juubi created the moon on his death bed. Obito said he could destroy the planet with Hagoromo's sword. Prime Hagoromo is quite possibly Planet Level. With two possible Planet Level characters and one other Stellar Level characters, does Stellar Level Kaguya not fit? I'd like to point out that the difference between Planet level and Star level is quite massive (according to our AP chart, a difference of 18750000 times, to be exact). One does not simply go straight from Planet level to Star level simply from stomping other Planet level characters. Besides, in your thread, you argued that Kaguya and Momoshiki are Stellar level only through dimension creation/destruction, which implies a power not useful for combat situations. If that's the case, what's the point of this? His Tanking ability should either Stay at Continent Level or Gai's Destructive Capacity should be increased. Madara's durability should probably just be listed as at least Continent level, along with Gai's final attack. ^If you're referring to Madara well he fought Gai with one rinnegan and no shinju three so how's that relevant? (Shrugs) I forgot, relax Chillax. 1. Kaguya being 4-C sounds pretty outlandish. So I agree, she should stay as is. 3. Idk about Naruto and Sasuke, maybe they can be "High 6-A, possibly 5-C" since essentially they are half of Hagoromo, and are definitely stronger as of the Last and Boruto considering Naruto survived an island level blast in base but idk that's just my two cent. We seem to have mostly agreed to list Madara at the same ranking as Hagoromo, which is "At least Moon level" I believe. The uncertainties arise with the calculation of Hagoromo's feat, which differed greatly depending on the method used, and as such reflects on Naruto's and Sasuke's rankings as well. In addition, my impression of their durability levels is as considerably lower than their strongest techniques have damage output, so I am uncertain where to place them in this regard? Also, I am unfamiliar with the relative power levels of their various transformations, and would like to know where we should place their ratings for which forms? Btw: All further discussion of Kaguya is hereby banned from this thread. We should focus on the issues that will actually lead anywhere. Naruto and Sasuke should both be listed as high 6-A based on their fights with Madara and Kaguya as both together could fight evenly with Madara and create a Moon together against Kaguya. 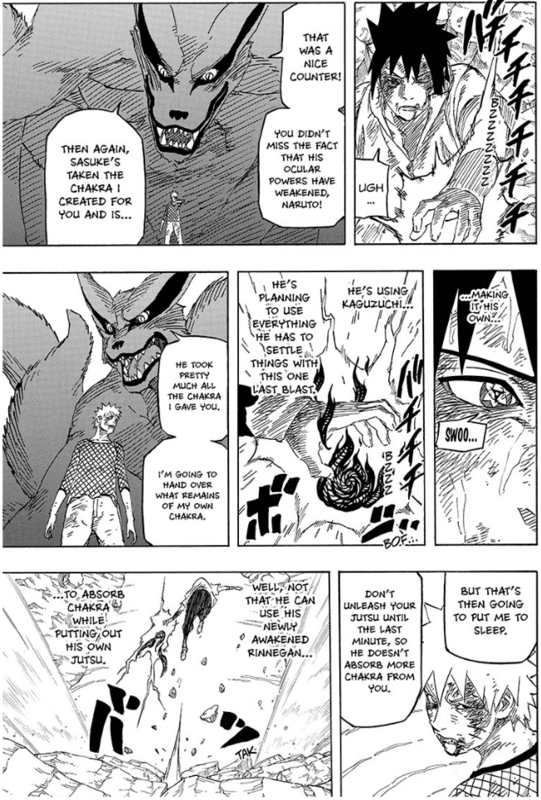 During their final fight Kurama stated that Sasuke after absorbing all the Biju chakra was at Hagoromo's level though and Naruto was able to match him. If Kurama's statement is accepted then they would both be 5-C and their durability would be Moon level as well as they were each able to tank each other's strongest attack and continue to fight afterwards. ^ Nah. A battle worn Naruto and Sasuke survived the clash of their strongest techniques. Since this is a thread regarding the stats of Naruto characters, there are some other characters who have some noteworthy feats. Gaara was capable of blocking Momoshiki's attacks with no apparent problem, who is currently Multi Continent Level. He was also able to pressure him with the speed of his sand and Momoshiki is MHS+. Hinata, Sakura, Sai, and Shikamaru was capable of surviving against Toneri's Silver Wheel Reincarnation Explosion, which was calced at Small Country Level. Here's the technique in use. Well, they were able to tank each other's strongest physical attack, while losing an arm each. If I remember correctly this clash was calculated at far less destructive capacity than their most high-level jutsu. My impression is that physical abilities in the Naruto world tend to contain far less raw power than reality-warping, energy-attacks, or similar. I've never seen a calc for the Indra's Arrow/Tailed Beast Bomb Rasenshuriken clash but Naruto used the same attack to destroy Madara's meteors and the attack could be seen from the Fire Country to the Lightning Country. Also Sasuke himself said Indra's Arrow was his strongest attack, and these weren't physical attacks, they were Ninjutsu, energy based attacks. Also they each lost an arm later in the fight actually, not during the clash of their most powerful attacks. That's right. Yes they did use their strongest attacks against each other, but it was much later on when Sasuke and Naruto did one final attack with their signiture moves did they lost one of their arms. Not really. They was in base form when that happened and they were already hurt for surviving that clash and beating each other to death for several hours to the point where they could barely stand. They were basically past their limits to the point where even Kurama couldn't provide Naruto with some power without going to sleep in exhaustion. It shouldn't really matter that they lost a limb for those reasons if you ask me. Dint i alredy explain how durability works on naruto? is the same as saying that whitebeard can get stabed or shoot but he also able to tank an island level attack. Hmm, so essentially their durabilities were down for running out on chakra? However, I don't buy that they had lost focus during their fight, and were injured due to this. An extra question that has turned up in the Kaguya page is where to place her durability? Given the extreme inconsistencies involved, such as being injured by Sakura, I placed it as "Unknown" for the time being, but this may have been inappropriate. Please take note that this is the only thing about Kaguya's statistics that we should discuss in this thread. 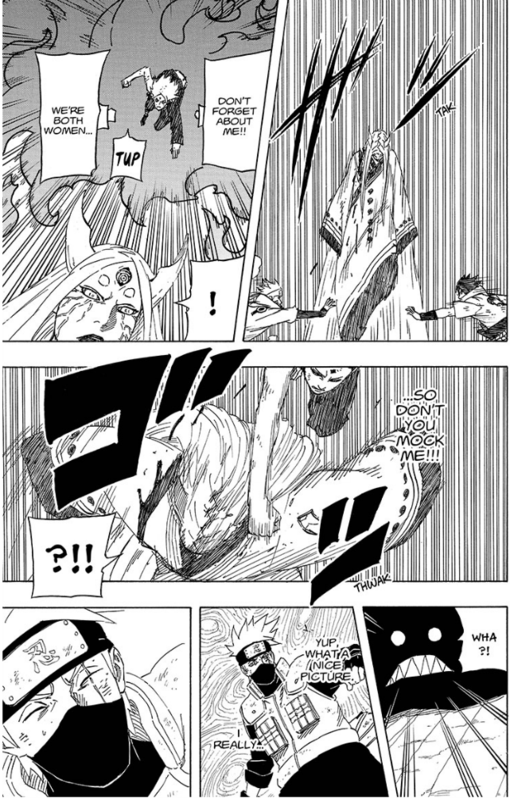 Naruto and Sasuke have attacks enhanced by Senjutsu and Six Paths Chakra that's a weakness for Kaguya/Juubi Jinchuriki. Given the fact that she was taking those attacks pretty well despite that shows that she some very strong durability. Moon Level-Moon Level+ and hard to kill with her immortality and regeneration seems okay to me. Okay. Is "At least Moon level (But her durability was portrayed very inconsistently)" acceptable? Sure I guess, though it should be noted that Sakura never injured Kaguya (or rather made her bleed) like everyone seems to think. Kaguya hurt herself by using her own speed and momentum against herself while trying to escape from Naruto and Sasuke. 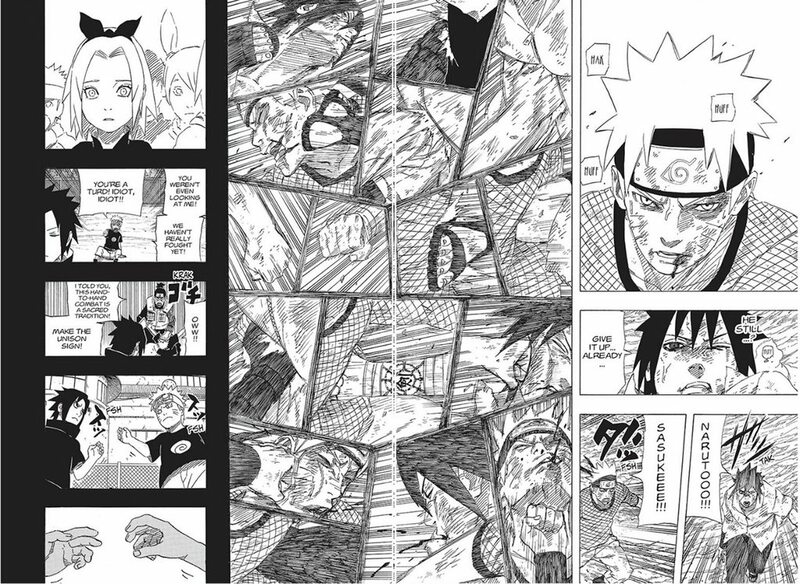 Going by the above images, I would say that Sakura legitimately managed to harm Kaguya. If not, Sakura would simply have been splattered from the impact. But thats her byakugans one blind spot so her guard was down. Then its justified her sole weakness it senjutsu and naruto was in a senjutsu mode. For Kaguyas case senjutsu should be added to her weaknesses. 1.Kakashi using kamui raikirii which ignores conventional durability. 2.Naruto with senjutsu her weakness. 3.Sakura but she was caught off guard she came from the byakugans blind spot . Sasuke was only a bit weaker than Naruto in the movie (it was either a misstep or Naruto's abilities were superior to Sasuke's physically, I don't know, nor care, it doesn't stop him from having the Moon rating. Madara gains the power to rival Sage of Six, k.
Kaguya stays where she is, she's barely relevant anymore since the worst version of Peach Boy came and seems like the far better villain. I agree with you though Sasuke admits he's surpassed Naruto since he doesn't train anymore. I mean... his training really shouldn't matter like that, the fact that Naruto wields the full power of his Bijuu at his disposal should be reason enough to why he's powerful. How do you surpass a guy who uses Bijuu Powers + Sage Chakra in tandem. It makes no sense to me, but whatever. And yes I know Sasuke has a PORTION of a Bijuu's power, and that still makes no sense. Just depends on whether or not the Hagoromo calc placing him at small planet is legit. Okay. Given that this is a bit above the middle of Moon level, I think that this gives a clearer indication of where to place Hagoromo, Madara, and likely Naruto and Sasuke. So where would Naruto,Sasuke, and Madara be now that there is a calc? So Madara's back to moon level now? Fair enough, though it seems like Madara's power stats have gone through so many revisions. Sounds about right, Naruto should be likely Moon Level with Kurama 100%, though, he mastered both his Bijuu and the Powers of the Sage of Six and the Bijuu Chakra boosts his power well above what it was in the final battle against the Rabbit. So At least Multi Continent level possibly moon level? I also think that they should all be Moon level, but it is up to Lord Kavpeny to decide. No, they shouldn't all be possibly Moon Level, Sasuke relies more on Hax then power, and though his Ancestral Fighting Robot is comparable to Naruto's power in the war, unless he tapped into larger wells of something he'd gained outside of Hagoromo's control aside from the Sage of Six chakra which he hadn't completely mastered beforehand. Bijuu Chakra intensifies the power he already possesses and he has full control over the second most powerful Bijuu in the world which gives him a head-start in pure destructive potential compared to Sasuke, as again, his Rinnegan relies on hax moreso than destructive potential. Actually he would via sheer power.Sasuke had gained half of Hagoromos chakra and the Ying release that hamura had and even half of Hagoromo is still moon level apparently. Aren't Naruto and Sasuke supposed to be equals though? They are equals in terms of what? Fighting skills? Because once again Naruto possesses the destructive capacity due to possessing Bijuu, Naruto should have more firepower, Sasuke should have more hax, Yin-Yang Equivalents, Yin is the destruction, Yang is the hax. Doesn't mean Sasuke possesses the firepower Naruto has, it only means he has far more abilities that can be used to defeat his adversaries, which has nothing to do with destructive potential. Otherwise Naruto being a Jinchurikki would be completely irrelevant. Hmm. I thought that they each received half of Hagoromo's power? They did however Naruto has since gained a completed Kurama. Though considering their combined performance against Momoshiki and their final fight, would they not be equal in terms of fighting ability? But Naruto also got the chakra of the nine bijuus, and in the end he got the other half of Kurama. Nah, the other Bijuu left him after that, but he mastered Kurama's power and Kurama was more powerful than three weaker Bijuu Combined. That was before he got the other half of his power from Flash Step, Kurama was that much stronger. Sasuke, like Naruto, acquired all the Bijuu's power and was more than capable of matching his power output. I'm pretty sure this is what Kishimoto meant by them being equal to each other. Correction they didn't get "half" of Hagoromo's power. Naruto got Ying release and Sasuke obtian Yang release which is a form of chakra, they didn't receive his power, they got acess to that power. There's nowhere stated that Hagoromo give half of his powers to them, since both Ying-Yang release is a form of Chakra not a power. Again, The Bijuu were taken out of them after that, unless Sasuke somehow kept the entirety of the Bijuu's power (he neither has internal conversations with them, nor shows any of the characteristics of having multiple Bijuu) I'm pretty sure he didn't have that power after the war. By all means, show me a time after the the war when he used their power, and I will concede. 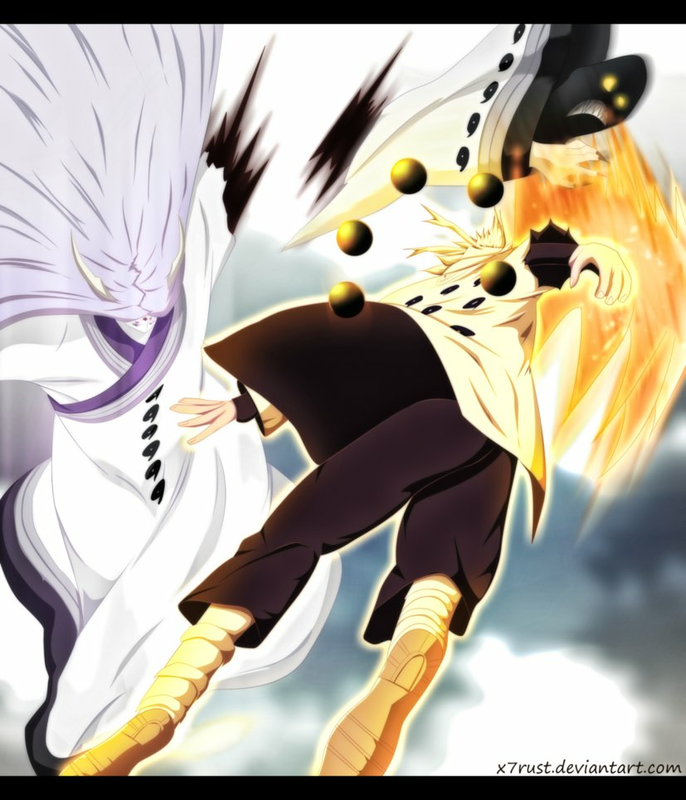 ^Hagoromo originally had yang release to begin with him gaining both of them is likely from left over Juubi chakra. So yes through power one gains those seals.If that weren't the case then Asura and Indra would have the same Ying yang release hamura and Hagoromo had.Hagoromo and hamura are as strong as they are because they're sons of Kaguya obviously.This all makes sense due to Madaras statement of having both they're powers. Naruto never lost the Bijuu's power either. It is strange, but there's subtle hints that show he still has their powers. He could still fly and he gained the power to release Kurama from his body without dying, something that only Juubi Jinchuriki are capable of. In The Last, Naruto used BSM to fight against Toneri, but in the Boruto movie he used RSM to fight against Momoshiki. Interestingly enough, Sasuke remarked that him and Naruto wasn't using full power because of all the damage that they would do. Sasuke still has the version of his Susanoo with the Bijuu's power too. I agree with what Davy0 said, it most by like Gohan not been able to use Ultimate form or lacks SSJ because of trainning. That's why Sasuke can still use Ying release and why he said in Gaiden that Naruto got weaker and never use Yang release again. Madara and Obito where both able to summon Kurama completly outside of their body and they were not Juubi Jinchuriki at the time. Wait outside their body what? See this is why I hate Naruto and Bleach, they don't make the facts clear enough. If they have the ability to cause Moon Level destruction or even Multi-Contiental Destruction, that statement is completely irrelevant to the factors, they'd be destroying vasts pieces of the earth, so I don't know what you see even remotely relevant to that. If he stopped training, why does that even matter. Using the Tailed Beast Ball Rasenshurikens would cause irreparable damage I'm assuming, because that's what you're implying. It makes Sasuke also sound like a moron if a character that was superior to the Rabbit came to fight and they needed to defeat them, then they'd have had no issues in doing so. They'd still have the ability to defeat Peach Boy with ease, yet they hadn't. Thus, Sasuke is an idiot. Yes, Sasuke's Ancestral Fighting Robot is permanently infused with Bijuu chakra, it doesn't mean that he himself can use said chakra for his own purposes, nor do we know the amounts. There's too much evidence that counters what you're saying. The only one who was fully committed to Naruto as a Bijuu was Kurama. The other Bijuu's never showed up as apart of Naruto in either movies, if you can show even an inkling of that being wrong, then again I'll concede to that. I highly doubt it, but I've been wrong before and shall proudly state myself as wrong. 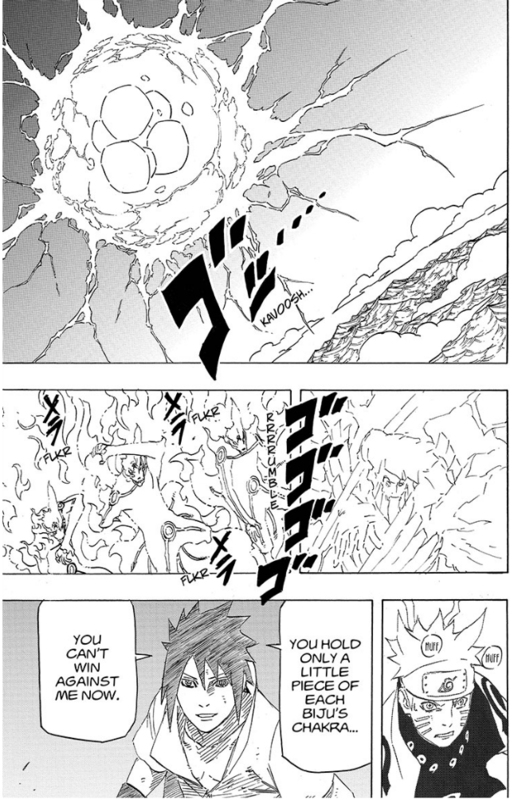 He released Kurama from his body after gaining 100% from him, how is that remotely relevant to him having the other 8 bijuu on his person and imbuing him with power. 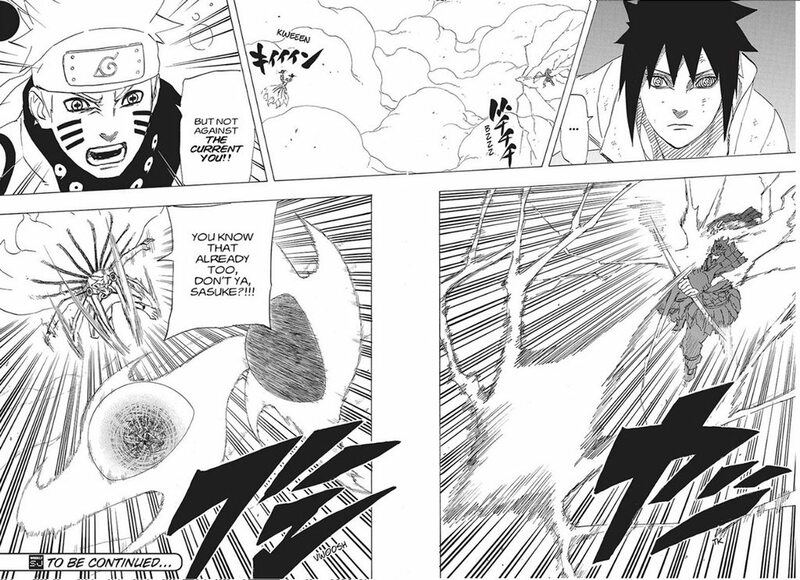 When Madara fought Hashirama in he past he was able to summon the juubi (Kurama) as a jinchuriki. About Obito he didn't summon it but when Madara summon him, Kurama took the same appearence from when Obito release him from inside Naruto's mother. Then in the Last Kurama takes a more humanoid appearence and not his chakra mode form that he took in Boruto movie. The way I interpreted, Sasuke saying that him and Naruto can't use full power had to do with the fact they were right in the middle of the village where there were plenty of civilians and they were with their kids too. It's kind of understandable why they wouldn't use full power if you ask. And regarding Naruto retaining all the Bijuu's power, I suppose it's a matter of opinion. Like I said, subtle showings suggests he still has their powers. Him and Madara could do that intangibility thing. And finally, he used RSM in the Boruto movie despite the fact he didn't use it in The Last. Kurama doesn't grant Naruto the ability to fly and intangibility. RSM does, something Naruto had only once he acquired all the Bijuu's power + Hagoromo's power. Like I said though, it's all a matter of opinion. Starting from the second sentence you made... Good for them. Him being able to fly doesn't mean a damned thing considering Six Sage Chakra could also give him that effect through mastery. As seen with Madara. OK.. What does that have to do with him having seven more Bijuu. Six Sage Chakra, he has more than one power to use, and Six Sage Chakra is capable of summoning Black Balls, Gave Madara the ability to fly as Juubi did not have such an ability and you can only use the black balls with Six Sage Power... Just because he only doe sit when he has the Bijuu's power, doesn't mean he could never do it. That's a horrible assumption to make... Are you saying that they are being propelled by their own power? Because there were no wings, no effects to state that Bijuu power was in effect while in flight either. It's not an opinion if you don't have solid proof, it's rational thinking. The only Bijuu that could fly from what I saw was the Beetle thing, and the Beetle thing made wings for flight. Even Juubi didn't show any ability to fly.